One of things I love most about what I do is I’m able to constantly test and try new products. 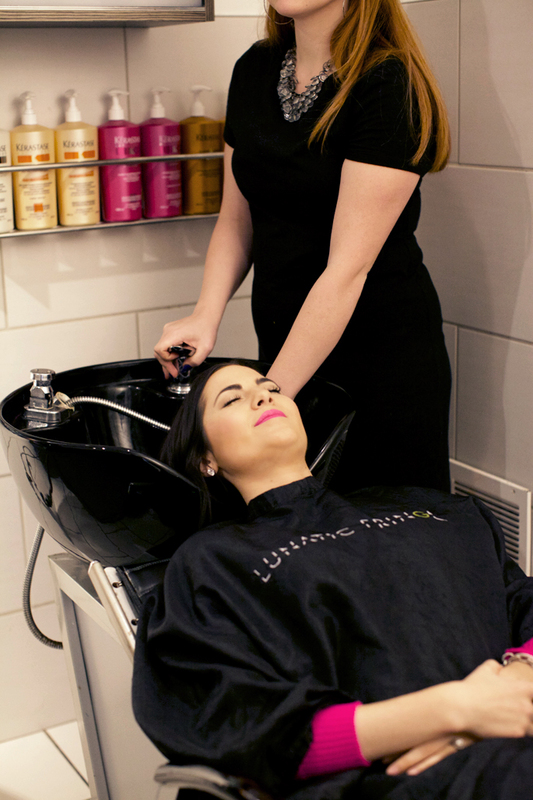 I had the opportunity to go to Lunatic Fringe, a Kérastase salon in Salt Lake to experience their new Fusio-Dose treatment! When I got to the appointment the stylists asked me what I thought my hair needed most; moisture, body, shine, damage repair, etc. I told her my concerns were moisture and body. During the winter time my hair gets super dry and my hair is so long that it falls flat to my head. Always. 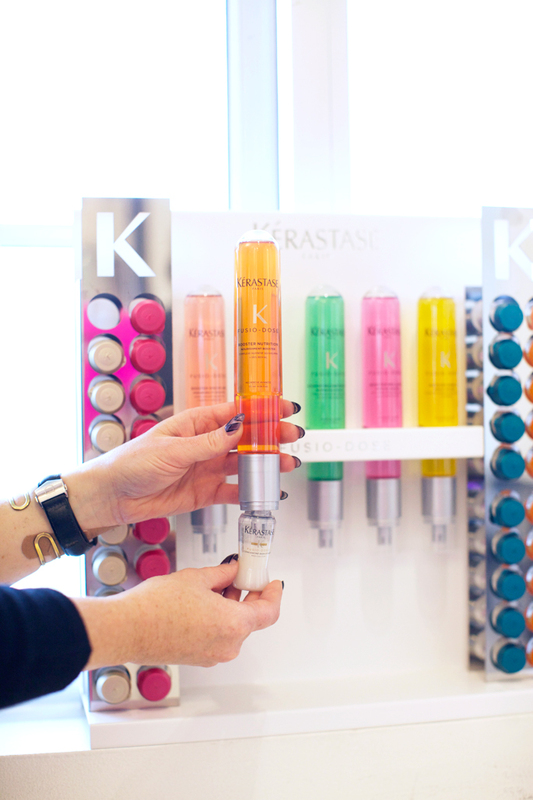 The stylist used a special technology that’s unique to the Kérastase brand to properly diagnose my hair and find out what it really needed most. 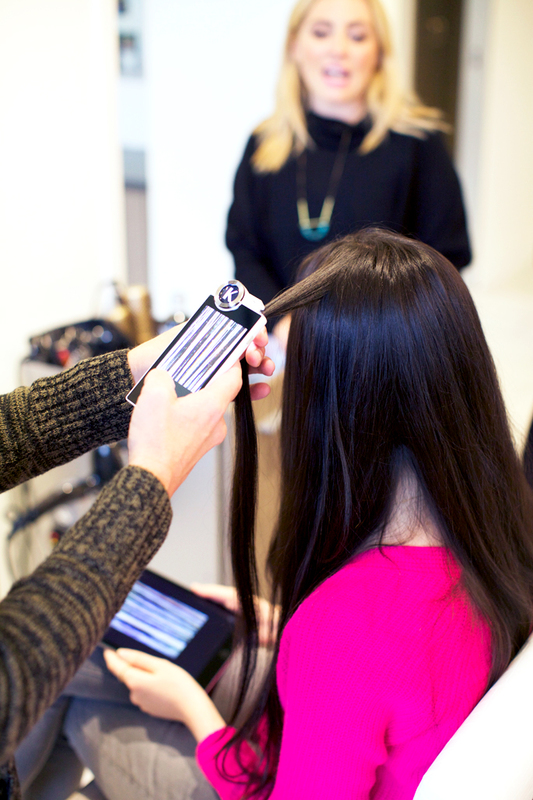 The camera looked almost like an iPhone but it’s basically a hair and scalp profiler that can zoom into your hair and scalp and has fiber up to 600 times checking for lack of shine, dryness and breakage. After she assessed my hair the stylist created a custom treatment for me from the Fusio-Dose Hair Lab using the Concentre Densifique (for density) and the Booster Nutrition (for 3x more nourishment). I had some breakage on my ends, fine hair and some dryness so my treatment helped my hair in all those areas. It’s really hard to find time to get my hair done these days because I’m a new mom and I work, so I love that the treatment only took 5 minutes. 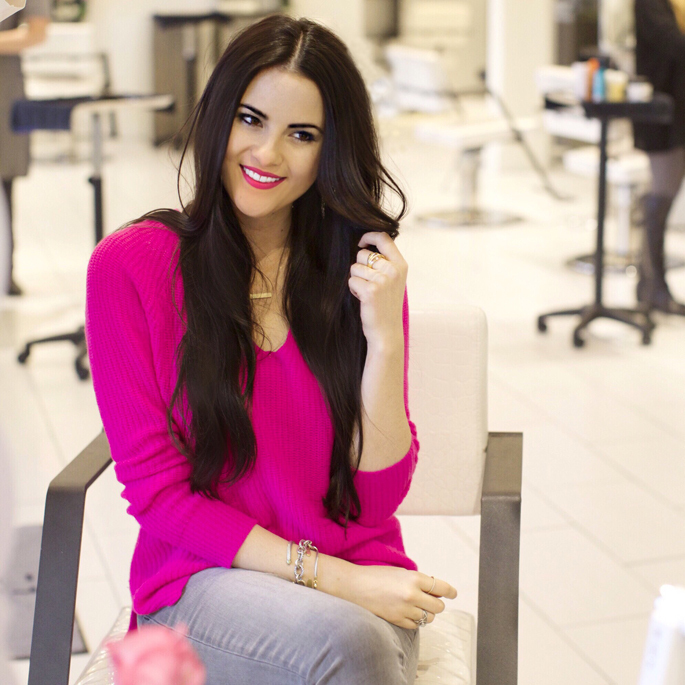 I was so excited to see the results and after they blew-out my hair I felt like a new woman! It’s been a week since my appointment and my hair has more body and looks healthier and shinier than it ever has! 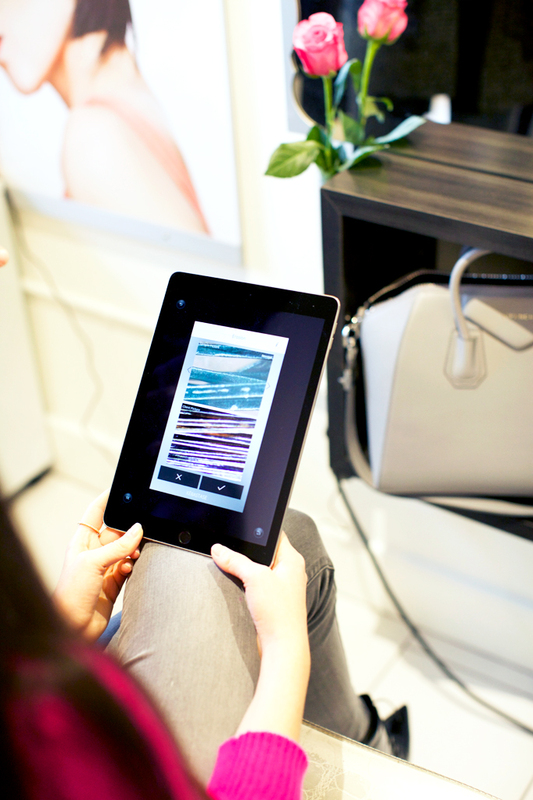 To learn more about the Fusio-Dose treatment, click here! 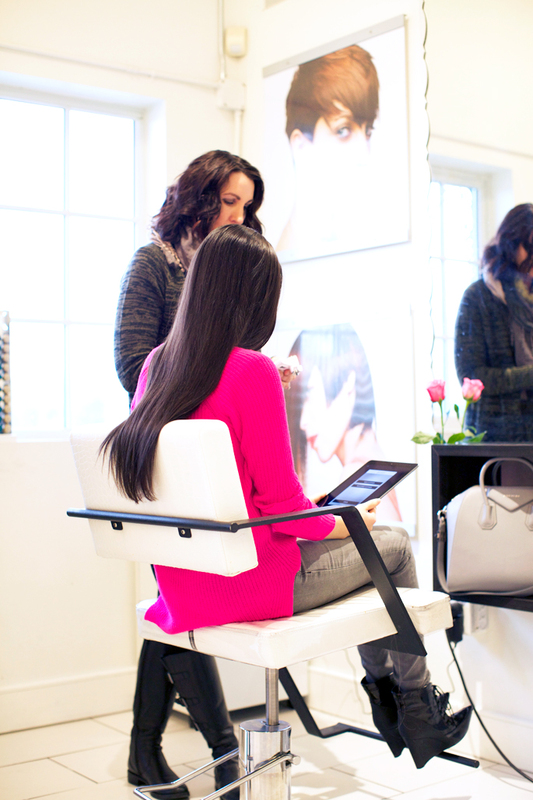 And you can find a Kérastase salon in your area here. If you get the treatment be sure to let me know how you like it! Brought to you by Kerastase. Great post! Love your bright sweater as well! That is amazing!! I need to do that for my curly hair! 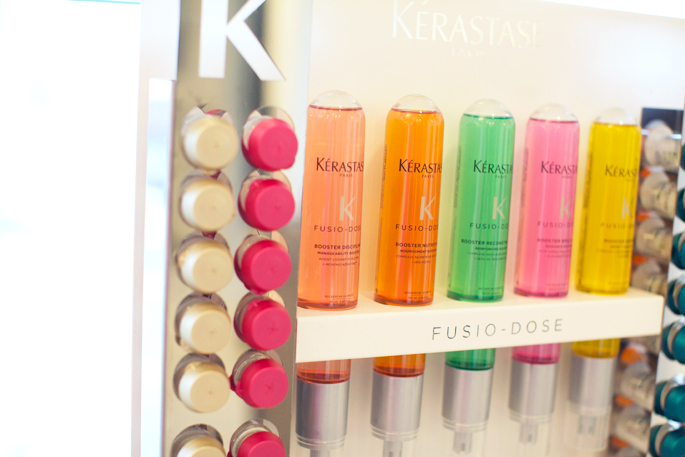 OMG I am obsessed with Kerastase. I just picked up their Christmas advent calendar from London and I can’t wait to see what goodies it has. I am off now to search for a salon in my area where I can get this treatment done. This looks so amazing!! Hopefully its not TOO expensive to tryout. I love your sweater! So beautiful and your hair, like it long and black. 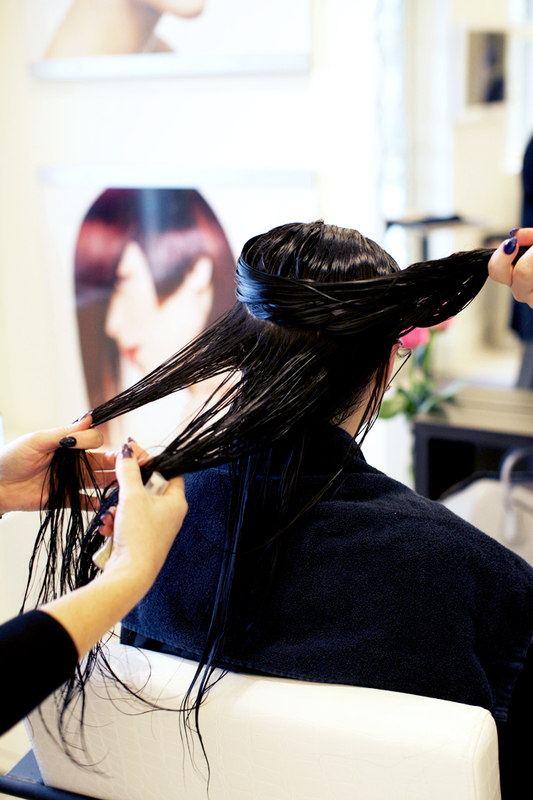 It’s time for me to go to the salon for a hair treatment too, every girl deserves a pamper now and then :)! Thanks for sharing your experience! I can see the difference in your before & after photos. Salon products really do make such a difference. 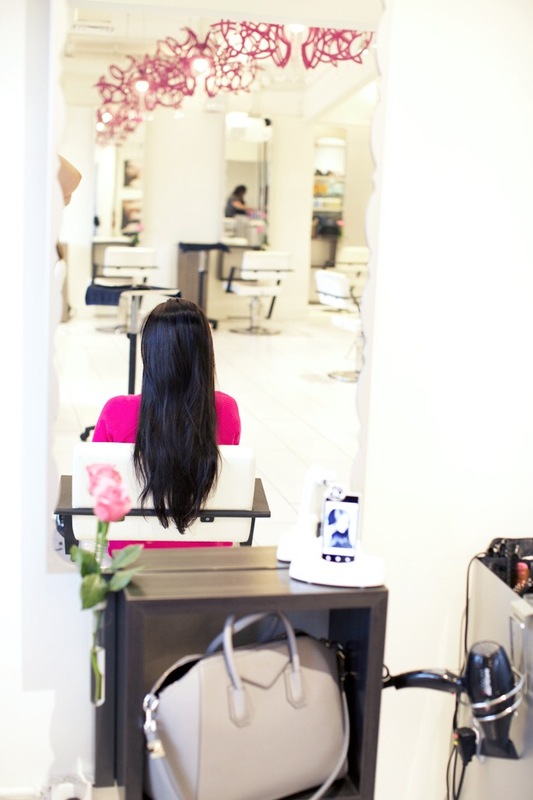 For myself personally, I have thin hair but a lot of hair so I can relate to the flat hair you mentioned with lack of body and also the need for moisture-heat and a/c both dry out hair, it’s nearly impossible to avoid. 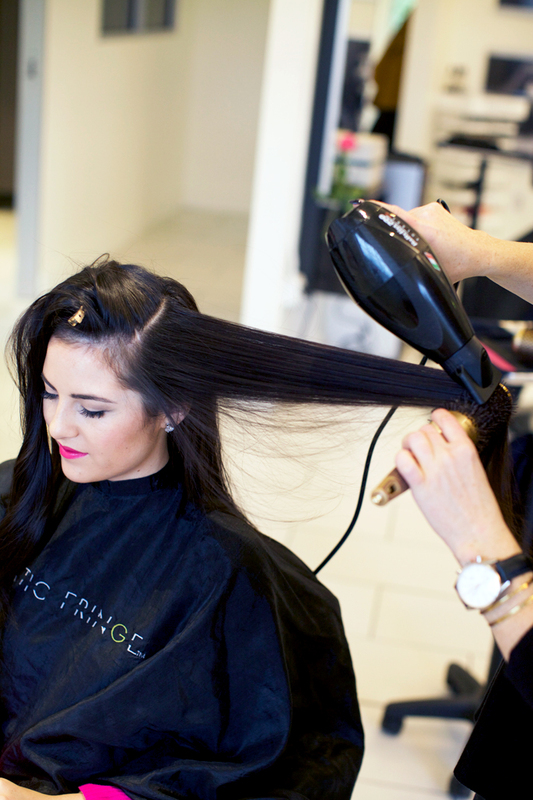 Having said that, as much as you love your long hair, a significant cut may provide the bounce you’re looking far and keep ends healthier. 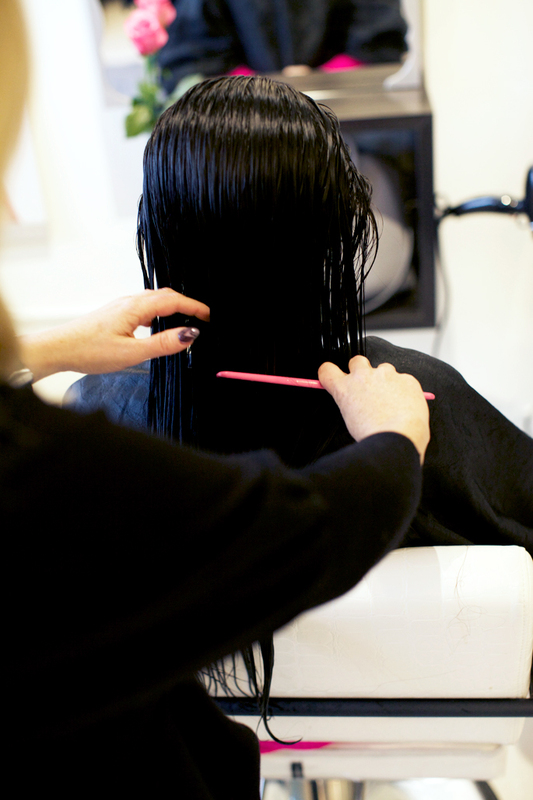 Have you ever tried about 5″ shorter? I’ve only ever seen you with this long length hair? There’s nothing like a good cut, that is for sure! My hair really needs this! I can’t wait to find a salon in my area. Love how your hair came out! Your hair looks great! 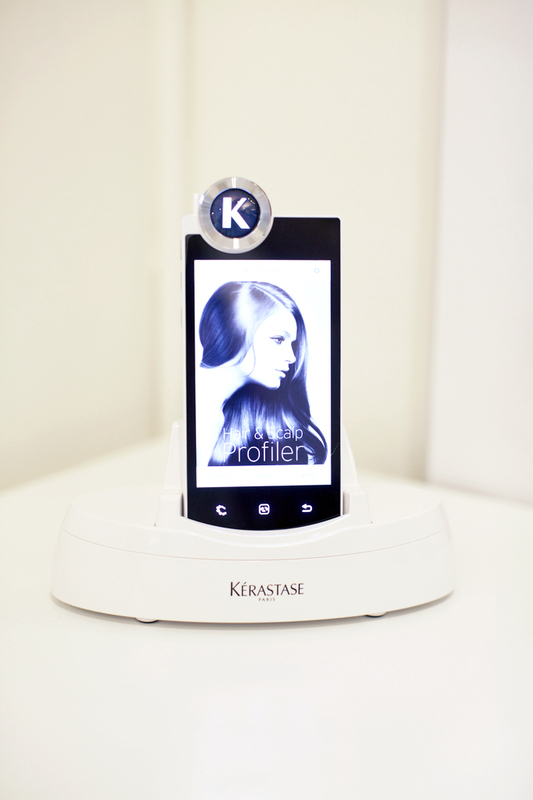 Never used Kerastase but heard great things! I also love your pink coat!! Love this and have always wanted to try it! I would like to try this treatment! Love the style and color of the coat! This is so cool!!!! I want to try this so badly. Looking up locations now! You are a very lucky girl, Rachel… your hair is gorgeous and always looks great!! This device sounds pretty cool… I thought it WAS an iPhone. Ha! That sounds so awesome! What a cool treatment! You have such beautiful hair, Rachel! Love the outfit, too! Your hair looks amazing and your outfit too! Love your pink coat! So cool to get a personalized experience. You seriously have the most beautiful hair! That coat is amazing! Your hair is always on point! Love your sweater and lipstick! Rach I am absolutely dying over that sweater, the color is beautiful on you!! You would love the review I did on my makeup essentials, especially on NARS products. They would be perfect for your skin tone! 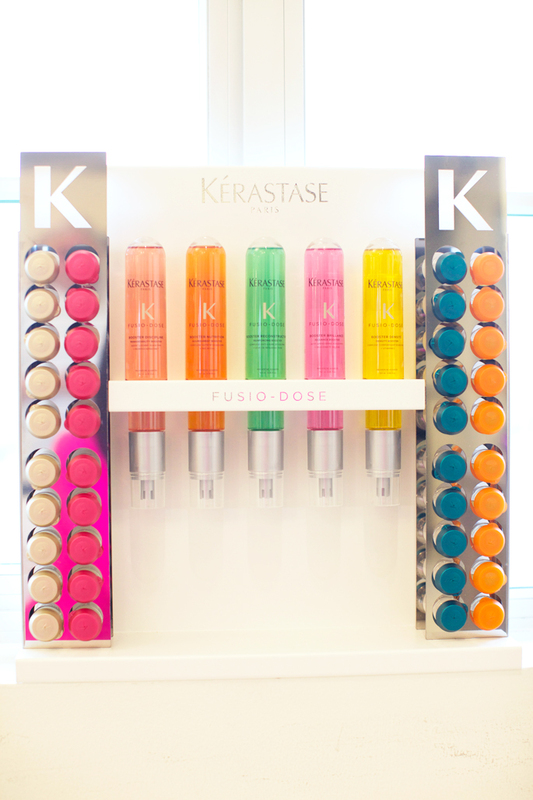 Love Kerastase products,and I love your hair! These pics are all STUNNING! What great technology! 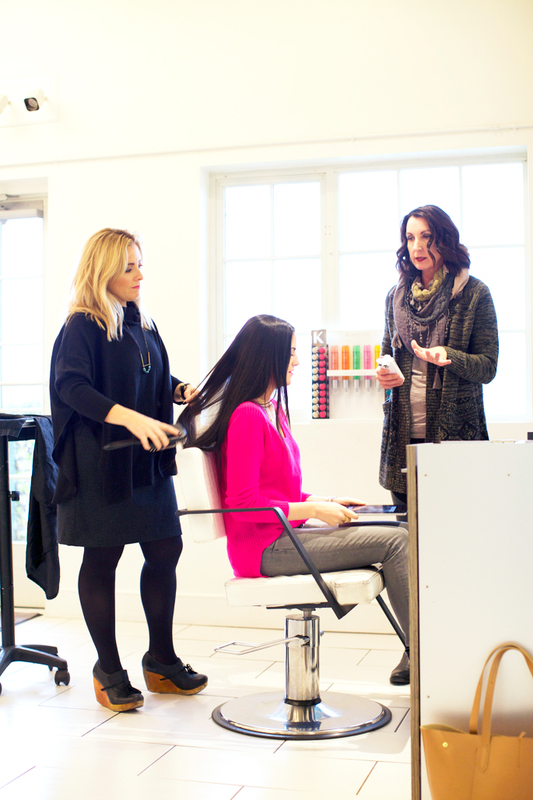 I’ve always loved Kerastase. Your hair does look beautiful! That is so cool how it diagnoses what your hair needs the most! Mine would definitely need volume and thickness! 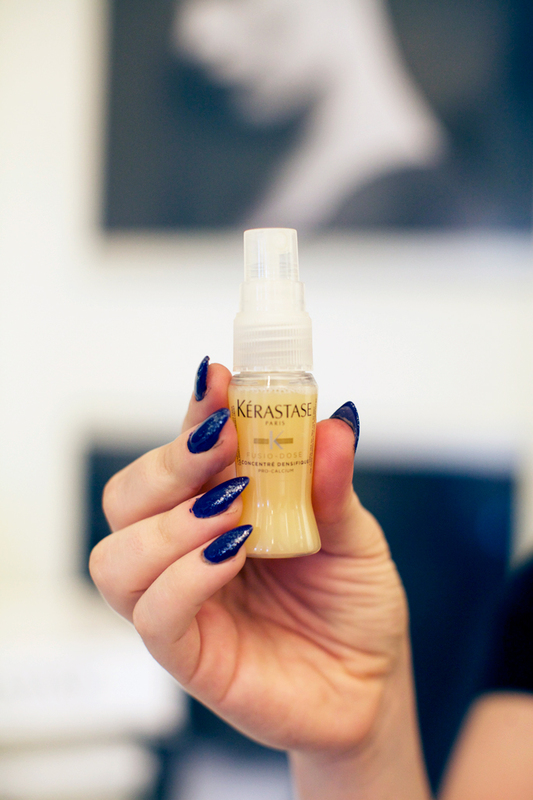 I swear by the Kerastase shampoo, I can’t go back to anything else! Beyond awesome! I’ve been using their products for ages. Gorgeous pics and hair! Where are those shoes from? They are fabulous! I have heard really good things about this brand. It makes me want to try it. This treatment sounds wonderful! It would be a great splurge Christmas gift to myself! Your hair is ridiculously shiny and beautiful! I mean, #hairgoals! First, I of course have to talk about your outfit; I love it! Those boots are gorgeous! As for your hair, it came out beautifully! You have such gorgeous hair, Rach :) I hope you have a wonderful day and thanks so much for sharing! Your coat is absolutely beautiful and so is your hair of course, I have never gotten a treatment before but I definitely want to try it out ! 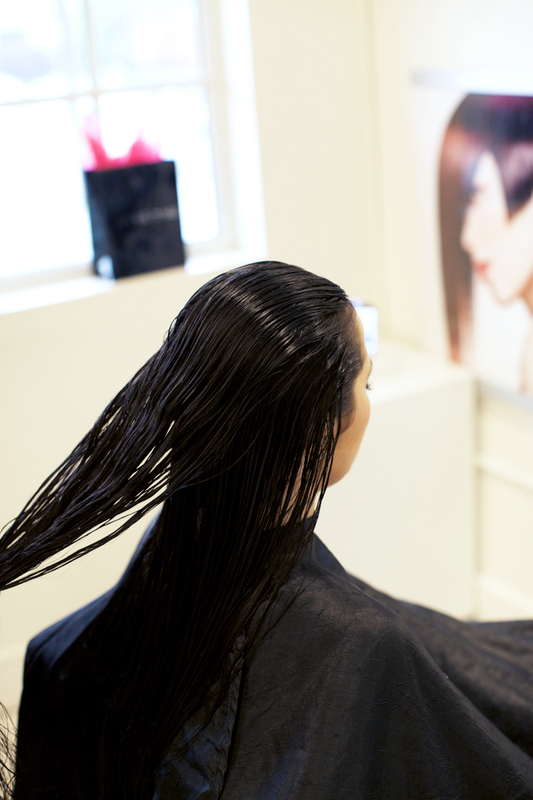 Wow your hair looks incredible after the treatment! It’s so shiny! I definitely should have this done to my hair. That’s amazing, I would love to have a hair profile done! I love the beautiful pink sweater and coat you have on. Great post. I love that sweater. Such a cool experience! 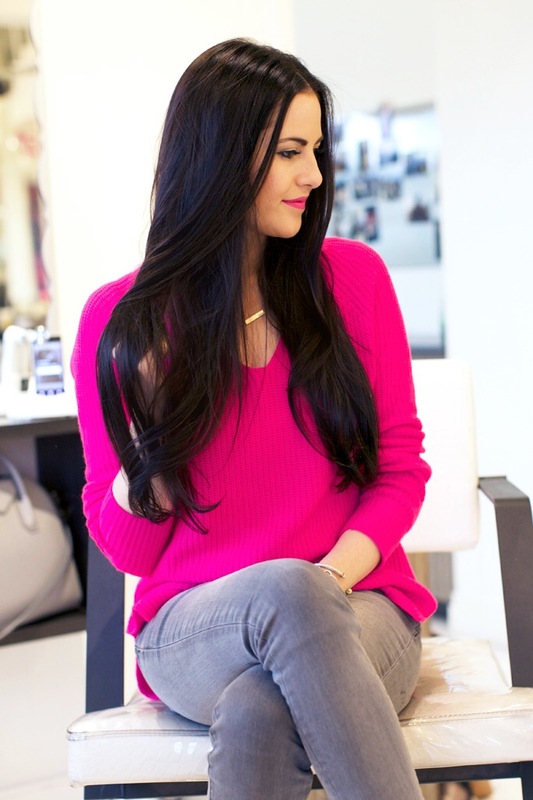 Kerastase is my favorite haircare product, and after using it for a year, my fine damaged hair is strong and shiny! Great opportunity! I heard of this product from another blogger and it sounds amazing.Your hair looks fabulous! what a cool concept with the camera! 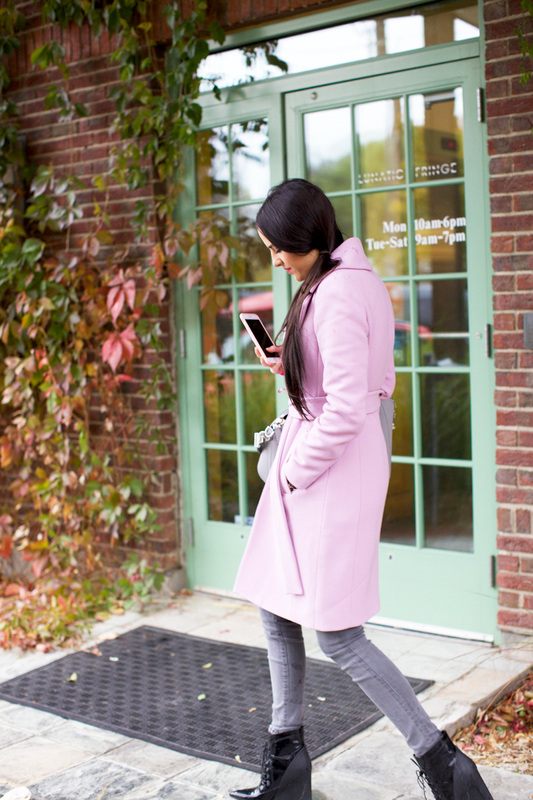 I’m so in love with the pink coat and patent leather booties! They look fantastic on you, and Keratase really did a great job on your hair, it looks SOO soft and full of natural volume! So cool! I need to do this!!! Love this post! The sweater is gorgeous! And your hair are really amazing! Can you give the detail of your necklace?